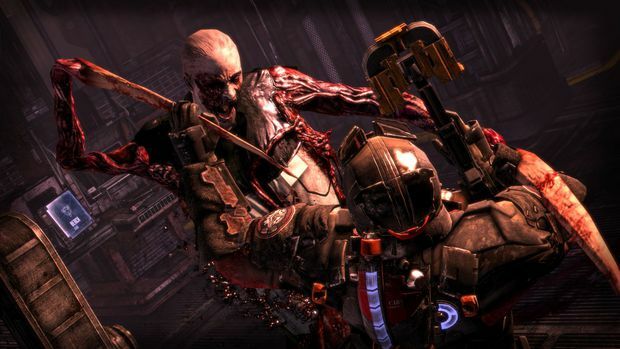 I got to go hands-on with Dead Space 3 again, this time playing the section that was shown off in the video above from the E3 demonstration. 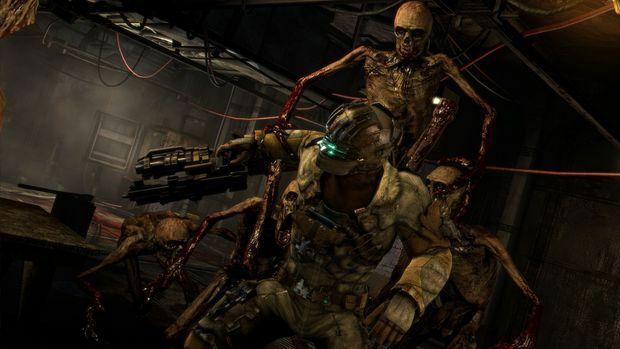 What I experienced was largely similar, but I did take away a few things that I thought I'd share with the Dead Space fans out there, especially those of you who have been worried about where Visceral is taking the series. 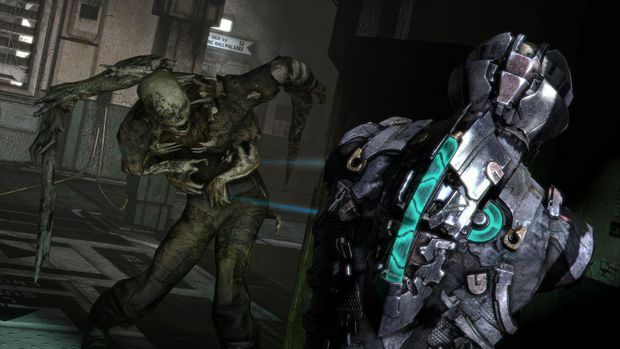 Dead Space 3 kind of features two storylines. There's the version where it's the more traditional solo experience, and then there's the whole co-op setup. The overall story is the same, but content is presented differently depending on which way you play. You can see this in action in the above video, where in single-player new character Carter can be seen on top of a building running from Necromorphs, or right alongside you in the co-op mode. Since things are presented differently, the game will wait for you to hit a checkpoint, die, or you can just restart a section before your co-op buddy can actually join after inviting them in. This way it doesn't seem weird when Carver is suddenly by your side after you just saw him on top of the previously mentioned building. Dropping out will also force a restart to the last checkpoint to again properly present the storyline. Is your friend low on health or ammo? Share an item with them! You can share any item in your inventory, just not actual guns. However, you can share parts for guns, which is likely tied to the new weapon crafting system. I didn't notice this at all, but one of the early complaints from Dead Space fans was how there's a "standard" aiming reticule in place as opposed to the holographic aiming system from prior Dead Space games. Well you can stop worrying, as you still have the option to use the holographic aim. It's a simple matter of changing over to "Classic" aim in the options menu. On top of the new rolling and crouch moves is the cover-fire system. Players will lean/take cover whenever they're taking aim near an object that can shield them. It's not so much Gears of War though, as Isaac or Carver aren't actually fully covered. In fact, they can still take damage from the new human enemy weapons since they're kind of poking out still. Weird, right? It fact, it's almost pointless because of that. I am loving the new roll move, though. It proved especially effective against the demo's boss fight as you're able to effectively evade the giant tentacles from crushing you when they slam down onto the ground. Speaking of which, the boss fight battle we've seen from the E3 demo is only half of what we can expect. The real fun begins after you've gotten sucked in. That Dead Space feel was still there even in the more open space of what we saw in the demo. I think the snow storm element lends itself really well, and it adds more tension than say the tight corridor stuff we're used to. You know to expect Necromorphs from an air vent in a ship, and can always brace yourself when needed. The snow element now means that Necromorphs can come popping literally from anywhere, even under your feet, as you can barely see anything in the storm. Pretty sure I'm always going to be on high alert now because of this. 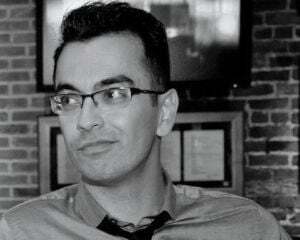 That said, I did get a different vibe from the section I played in co-op. It's less fear-inducing knowing you have someone watching your back. There's still a level of stress, but not as intense as in single-player. Don't get me wrong here. It's still fun in co-op, but I know for a fact now that I have no intention of playing co-op until I've played through solo and experienced the more traditional Dead Space. Then I'll play through co-op. Overall, I think Visceral is on the right track with everything they're offering. Traditional fans should be pleased, and at the same time it offers something easier for players to handle that normally can't deal with scares through the co-op.